The Association of Fundraising Professionals (AFP) has been serving for more than 50 years as the standard-bearer for professionalism in fundraising. You are one of nearly 30,000 members in more than 200 chapters throughout the world, working to advance philanthropy through advocacy, research, education and certification programs. As a value-added benefit of membership, we are happy to announce that the Greater Louisville Chapter provides its members numerous opportunities to participate in professional development by offering scholarships. Please take time to review the scholarships, apply for one – or many, and share this important information with colleagues. We want to ensure that all of our chapter members are aware of and apply for these transformational opportunities. Scholarships are available for our entire AFP Greater Louisville Chapter membership – new, mid-level, and seasoned professionals are encouraged to apply. It is our hope that you will use these benefits to heighten your enjoyment of our chapter and understand how much we appreciate your important support of our profession! The AFP Greater Louisville Chapter funds educational scholarships to encourage participation in professional education courses and to help individuals serving nonprofit organizations develop their knowledge and skill in fundraising. All members, regardless of level of experience, are eligible to apply for these scholarships. The Greater Louisville Chapter awards scholarships on a rolling basis during a calendar year. Funds will be awarded until the deadline is reached, or until funds are depleted. Please apply as early as possible and allow at least 60 days to process your application. 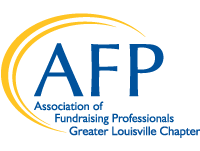 The AFP Greater Louisville Chapter funds full and partial memberships to allow professionals in our non-profit community the opportunity to access the resources and offerings for AFP. All professionals in the non-profit community are allowed to apply. The Greater Louisville Chapter awards scholarships on a rolling basis during a calendar year. Funds will be awarded until funds are depleted. Please apply as early as possible and allow at least 60 days to process your application. The AFP Greater Louisville Chapter is committed to developing and maintaining a diverse organization that reflects, is responsive to, and embraces the diversity of the communities we serve; respecting and valuing all people. Fundraising professionals who self identify as coming from a diverse background or fundraising professionals who work for a nonprofit serving a diverse community are eligible to apply for this scholarship that provides a one year AFP membership. Deadline to apply is May 15, 2019.